Aera employees prepare to judge the science fair at Grimmway Academy in December (back row, from left): Carlos Vega, Shree Bhandari, Grimmway Academy’s Sarah Peterson, Patrick Tsang, Paulina Christenson, Matt Kedzierski, Marc Obenshain, Kristi Culligan, Alphonso Valencia, Nancy Sheltren and Mike Arias. Front row from left are Jamie Swetalla and Raj Patel. By creating science projects and engaging with Aera judges, students in this rural area see the possibilities of entering the STEM field. 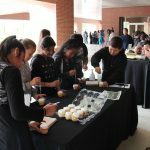 Young students in Kern County’s rural areas don’t often get the chance to share their science-fair projects with real scientists and engineers. 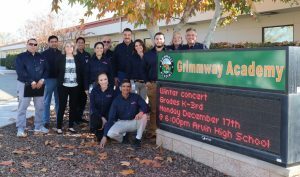 But students at Grimmway Academy in Arvin do. 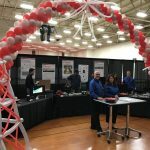 For the past five years, the public charter school has relied on community volunteers, including Aera Energy employees, to serve as judges in its annual science fair. But the academy’s most recent science fair marked the first time that Aera employees alone served as judges. “We wanted to ensure we had quality, knowledgeable judging from people experienced in science and engineering,” said Sarah Peterson, the school’s STEM instructional coach who organizes the yearly event. Twelve Aera employees lent their professional expertise to evaluate the science projects, interview the students and give feedback. 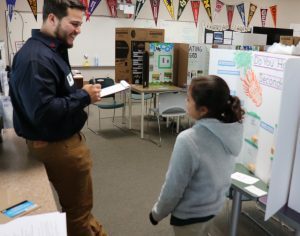 Aera’s Matt Kedzierski evaluates a science-fair project at Grimmway Academy. “For many of our students, it’s the first time in their lives they’re speaking with someone who’s professionally invested in science,” Peterson said. The event took place Dec. 13 on the school campus, about 17 miles southeast of Bakersfield. The Aera judges evaluated 80 projects. 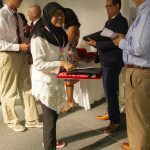 That number had been narrowed down from 700 science-fair projects, one for every first- through eighth-grade student at Grimmway Academy. The school’s STEM teachers chose the top 10 from each grade for the Aera judging. Aera’s Alphonso Valencia interviews a Grimmway Academy student about her science-fair project. If its recent science fair is any indication, Grimmway Academy is growing a crop of future scientists. Ten will go on to compete in the Kern County Regional Science Fair in March. Having judges from outside the school not only gives students a sense of importance but also rewards the adults. Lending their expertise to help science-fair participants comes easily to Kedzierski and his fellow Aera judges. “It fits with Aera’s whole philosophy of giving back to the community and engaging in partnerships,” he said. 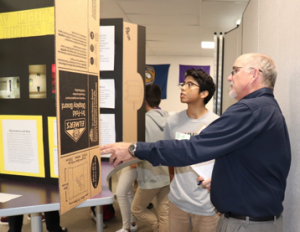 Aera’s science-fair relationship with Grimmway Academy began with a conversation between Peterson and her friend, neighbor and Aera employee, Marc Obenshain. We live our safety motto that “Every day, everybody goes home alive and well!” / DID YOU KNOW? Aera Energy has been honored with the North American Maintenance Excellence Award and the AME Manufacturing Excellence Award. / ©2019 Aera Energy LLC. All rights reserved.